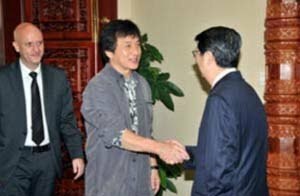 A famous Hong Kong and Hollywood Film Star Jackie Chan, better known for Cambodians as Chhin Long, meets here on Wednesday with Cambodian Deputy Prime Minister H.E. Sok An, Minister in charge of the Office of the Council of Ministers. During the meeting, Jackie Chan told Deputy Primer Sok An that he wishes to make a firm about one island in Cambodia and some places at Angkor Wat Temple as well. In reply, H.E. Sok An informed his guest that Cambodia is riches of national heritages such as ancient temples and beautiful nature as well as glorious civilization for local and foreign film makers to produce films.